Tuesday October 24 2017 - Kingstonsnows ext. A relatively storm week lies ahead. Today, a plume of moisture from the Atlantic Ocean will keep us under a rain-threat. Intervals of rain showers will persist throughout much of the day at varying intensities, and total rain could approach an inch. Late tonight, the rain-threat shifts off to our east allowing some sunshine for Wednesday, but by the next day, the hose could splash back toward New York — showers are possible Thursday evening. Calm weather Friday and Saturday will give way to fresh firehose of rain late in the weekend. As for the temperatures, They will continue to run above normal for this time of year. Temperatures will dip from around 70 to around 60 as the first storm system passes us, but then rebound a bit as the weekend's storm approaches. The average high temperature for this time of year is 57, and the average low temperature is 37. Tuesday's rain showers will be due to a large quantity of moisture being pulled off the Atlantic Ocean. 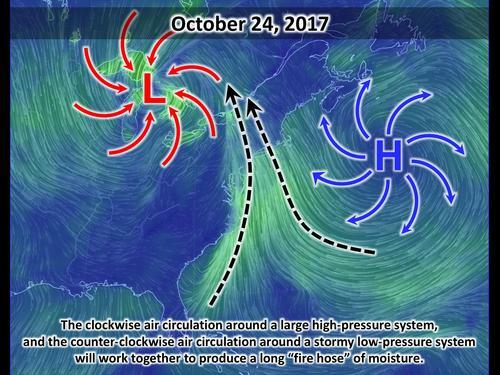 The clockwise air circulation around an off-shore high-pressure system, and the counter-clockwise air circulation around a stormy low-pressure system over the Great Lakes, will help to funnel the moisture over New York. The image above is of the surface winds. The green streaks show the direction of the air flow, with brighter areas depicting faster wind speeds. The wind direction is carrying moisture from the Atlantic into the coast. Kingston is located just below the two black arrow-heads. The picture above is of the latest radar. Greens depict where rain is currently falling. The wind direction arrows from the first image are overlaid on the image. Again, Kingston is located just below the two black arrow-heads.